In keeping with past tradition, we’re combining our November and December issues of rez Magazine into a single “holiday” issue, to give our tireless staff (and writers) some time off to be with their families. So, we’ve packed two issues into one this time and are you ever going to enjoy it. First, Jami Mills was so inspired by her recent trip to Japan that she kept a journal and busily shot the things that struck her fancy. We’re glad she did because The Chronicles of Jami: Japan is the result. Tokyo, Kyoto and the Japanese Alps were the focus of her piece. First time contributor, enola em Vaher, the owner of the esteemed Chelsea Hotel, gives us a stunning short story, Need, about the universal themes that bind us, with a cameo appearance by an all-knowing angel. Zymony Guyot knocks us out again with his wonderful be-bop rhythms in his poem, Buzz, where he calls the current state of affairs like he sees ‘em. RoseDrop Rust returns with Camera Obscura, in which Rusty re-connects with his Muse, in a way only someone with a great command of his voice can. Neruval, the AI owl who sits atop Art Blue’s shoulder, has added more fuel to the speculation that he is actually Art’s brain. Neruval pens an open letter, To Whom it May Concern, and takes control of Art’s narrative. Poor Art. He never really stood a chance. Dearstluv Writer contributes a short poem that is packed with emotion about the loneliness and suffering of the elderly. No one treats this sensitive subject more compassionately. Jullianna Juliesse brings us a deeply personal poem, Pariah, wherein she shares her feelings about giving, taking, and being part of something more. With Rosa, Cat Boccaccio dazzles us once again with her insight into what makes people tick, this time taking us into the agony of loss and the durability of the life spirit. 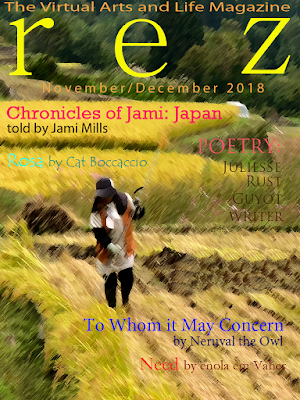 We hope you’ll find time over the holidays to peruse this fine issue, which includes some of the most talented writers inworld. And if you don’t have time to read, then just look at the purdy pictures. Happy Holidays, from all of us at rez Magazine!